How do you know when your students are ready to read and spell CVC (consonant vowel consonant short vowel pattern) words? When you’re following a set curriculum, it’s often full speed ahead, ready or not! Looking at an individual letter and producing the corresponding consonant or short vowel sound? It’s okay to rely on a key word! Hearing an individual consonant or short vowel sound and saying or writing the corresponding letter? Can they segment the individual sounds in a three-phoneme word? Can they blend three phonemes to say a word? If you answered each question affirmatively, then… Ready! Set! Go! One of my favorite tools for teaching decoding and encoding of phonetically regular words is a letter/ sound mat. I purchased mine from Carson-Dellosa and crafted my own letter cards (letters are aligned to overlap, digraph cards added). You can always use the cards that are sold with the mat. This activity can be used with an individual or small group of students. For reading or spelling, you can use one mat hanging on a magnetic surface. For spelling, each student can also use their own mat on a flat surface. Prepare your letter/ sound mat(s) by printing the free letter cards. Print on cardstock (easier for little ones to grab), laminate, and cut. You will need two sets of letters for each sound mat. You can print the red vowel cards on white cardstock or the black vowel cards on colored cardstock. Place two sets of the same letter, one behind the other, in each pocket in alphabetical order. This allows your students to take one out and see exactly where to put it back. If you have followed an instructional sequence of letters such as that suggested by the University of Oregon’s Big Ideas in Beginning Reading, you will have started off teaching letters and sounds that will naturally lead into reading and spelling two and three letter short vowel words. For example, once you have successfully taught the letter names and sounds for a, m, t, s, i, f, and d, you can teach how to read and spell 14 words (am, sam, tam, dam, at, mat, sat, fat, it, sit, fit, mad, sad, if). When using this approach, turn all other letters to the blank backside, showing only learned letters. If your students are secure in their knowledge of most letter names and sounds, leave all letters visible. You can use this activity with any list of phonetic words; self-created, from your reading basal, or from an Orton-Gillingham based manual. There is a popular multi-sensory program which uses finger tapping for blending and segmenting sounds. This does provide for tactile input. For some reason, I prefer a thumbs up approach. I simply find it less confusing. The thumb and fingers can stay up to provide a visual reference. To use the letter/ sound mat for spelling, you say a word (ex. sit). Students echo the word. Students segment the sounds (/s/ /i/ /t/) starting with thumbs up or by finger tapping. 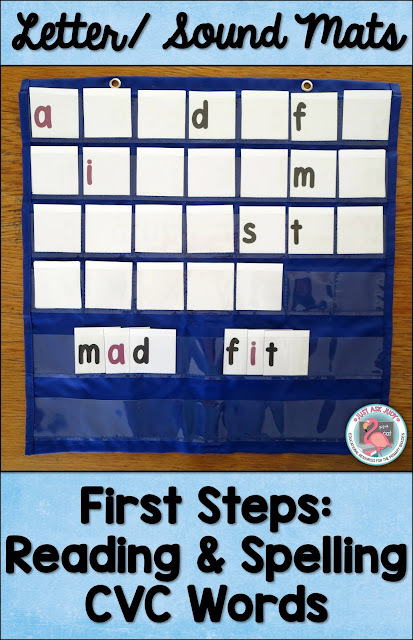 Students can segment first and then pull each letter to one of the bottom rows to spell the word or complete both steps simultaneously. After the letters are in place, students touch each letter in sequence while producing the corresponding sounds, then blend the sounds to read. Put the letters back in place to be ready for the next word. You should provide corrective feedback as needed. Model segmenting the sounds or emphasizing the sound for a misplaced letter. For reading, the teacher places letter cards (m-a-d), one at a time in one of the bottom rows while the students produce each sound using the finger tapping or thumbs up procedure. Students blend the sounds to read (mad). Provide support as needed. Put the letters back in place. The letter/ sound mat is just one way to read and spell phonetically regular words. 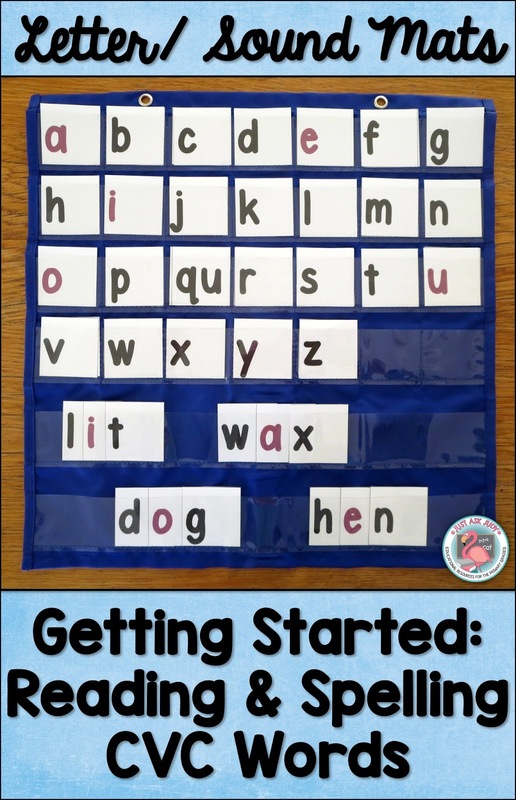 Most of the materials mentioned in this post on reviewing letters and sounds, including magnetic letter boards, can be used in a similar way for spelling. These free letter cards include consonant digraph and -ng/-nk cards joined with vowels to keep your learners progressing. What is your favorite way to explicitly teach reading and spelling CVC words? 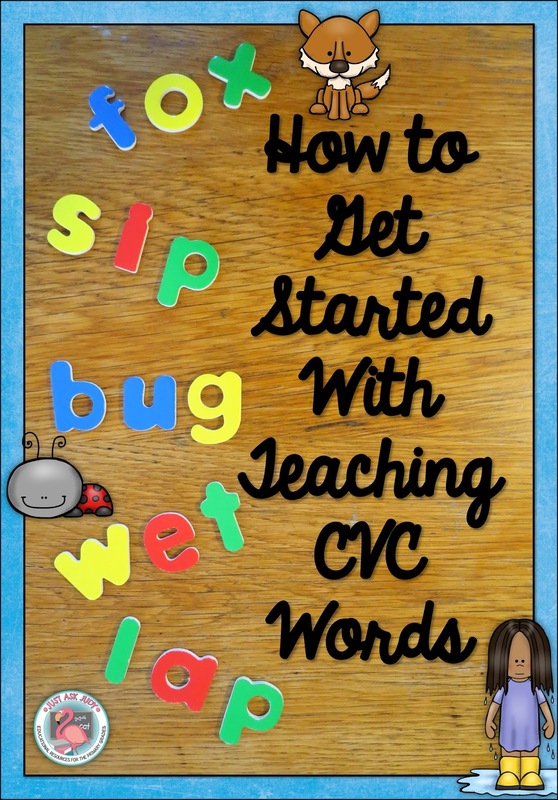 You can find additional CVC resources, including those linked below, in my Teachers Pay Teachers store to keep up the learning momentum. There’s still time to enter The Things We Love Giveaway in the post below! Be sure to browse this Pinterest board for additional ideas and resources. Thanks for the introduction to sound mats. What a great system! Thanks for the great ideas. I like the way you've broken them down and fixed them up, giving kids multiple ways to respond.